The Culter Courier is published four times a year: in February, May, August and November. 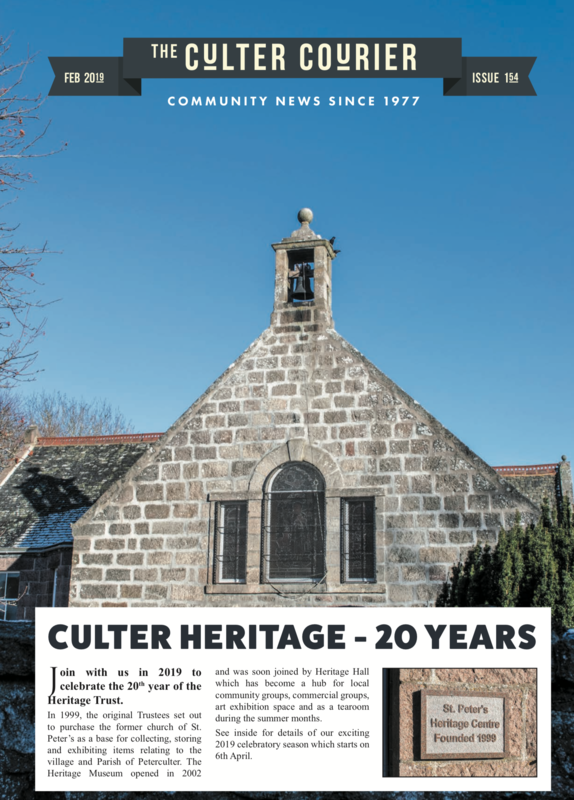 It is delivered to over 3000 houses in Peterculter and is widely read for its news on local groups and issues and for information on local businesses. It is run by volunteers with any profits donated to local good causes. Contributions are welcome from any groups with connections with Culter or who have information which will be relevant to the residents. The deadline for articles is usually around a month before the publication date. See the deadline box for more details. Adverts are accepted for the Courier depending on available space. Local business generally find the advertising to be worthwhile. If you provide an advert as a pdf or word document, that is suitable to go straight in, there is no added design fee. If we have to adjust (re-size) or design a basic advert there is a £15 fee. More intricate adverts can be designed, please contact me for more information regarding costs. I send invoices by email after the issue of the Courier and can post a copy on request.